The best start of a day is by getting up out of bed while smiling and there won't be a smile unless your dog is lying in bed next to you as you open your eyes. That would even be better when you look at the window with a nice sunrise. Also, there is no good start of a post without a nice giggle and there won't be a giggle if you haven't thought that you are so hungry in the morning, and had a big meal which ended up too much and made you a little bit heavy haha. I don't think I nailed this intro for the post as I said in my previous post, but I hope it's something that will make you smile at least and I will put more work on it next time. Anyways, here we are already in the next half of this month, and I'm still lacking posts haha. That's not a good sign of me getting my goals finished in time, but at least trying to do it as hard as I can, you know. I always remind myself that sometimes we have to crawl for a bit even if we were going forward at a good pace. 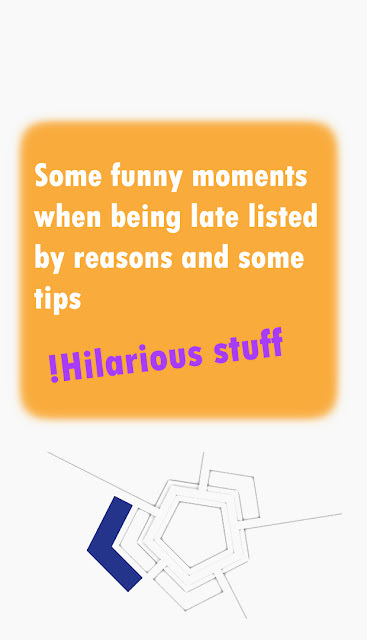 Today I thought of writing some moments that occur when we are in a rush because of being late and as always, we are here for entertainment which means it will include some funny moments, but with some tips from my experience because I've gone through it so many times before in my life. So grab your coffee and enjoy some times reading this post. I hope it will make you giggle and start your day with a nice start that will fresh your mind and thoughts. 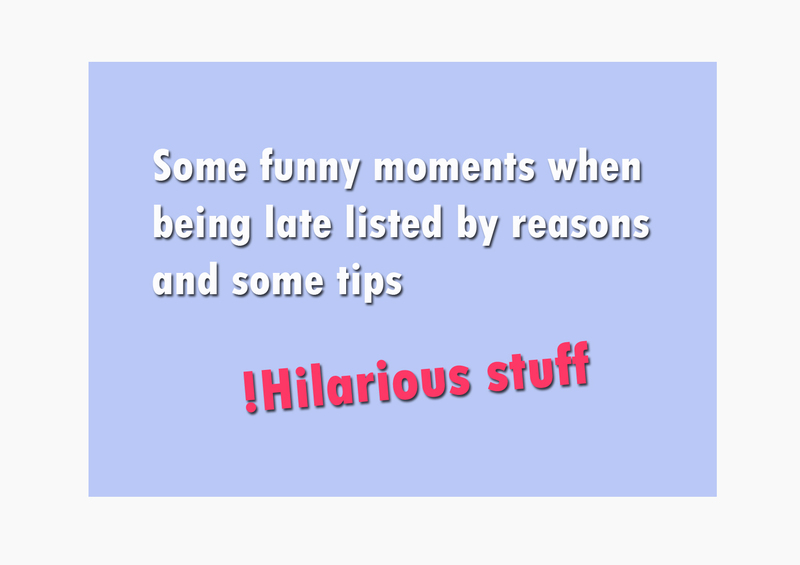 I'm sure there are so many of us have gone through some moments being late for different reasons and at least done something funny. I could write a very long post and still have so many stuff to mention. However, as usual, there will be only the most three funny moments that would happen because this would be a good amount to make it entertaining and this is what I always write. I want to put this in a list and the best way to do that is by listing all the moments by reasons because there should be something that causes the being late moments and there are countless of them, but I will mention is the most frequent reasons. I think taking some rest is something we tend to do in our life because we feel tired after a long morning work or didn't get a good sleep at night, and want to prepare for something and don't want to look tired during the process of doing it. However, taking a nap sometimes can take time more than what you planned to and then, that would make you late if you still haven't' finished everything or have something should be done. Like if there was an important meeting was sat up in a certain time, and hours before that time there was enough time for a nap, but because you didn't get enough sleep at night, you took a bit long nap but not too long, and woke up rushing and freaking out thinking that it's too late, but there still time for you to get ready. I once forgot to put my brother's car key before leaving because it was with me when I grabbed it by mistake, and he had to wait until I get back haha. Tip: I would recommend you to concentrate on everything you do while being late because you can do things fast and quick, but that doesn't mean you lose focus. This is one of the most things we do during times we don't have work or sometimes when we are waiting for something or someone. You can't get bored of doing this unless you have finished every video which kinda impossible to happen because there are so many types of things to watch online and still there are even more. However, there is nothing wrong with doing this unless you still have work to get done in a certain time. Like if you have finished writing a blog post and got everything ready early before your posting schedule and thought to watch some videos in the living room until the time comes. Then, Watching videos made you lose focus on time, and after few minutes, you realized that it's getting passed time and suddenly freaked up and stood up like crazy while one of the family members was sitting with you haha. That would make a good, funny reaction of him haha. Tip: You can always schedule your posts before an hour of your posting schedule, but you can also keep an eye on the time as you watch videos. There are so many reasons why we would watch the television or shows, series, and as you know that game of Thrones has released the last season and everyone is so excited to watch it. However, if there is another purpose to stop watching and do something would interrupt your time enjoying the series(getting up in the middle of the episode) or the show you watching because I don't really like when this happens to me as well, you know. Like if you need to pick up your friend from somewhere and during the time you were waiting, you decided to watch the television with your brother. After a couple minutes of the episode, while watching and sitting on the couch, you realized that your friend is waiting for you to come to pick him up. Then, you stood up in rush and hit your brother's cup full of tea and ruined his moment haha. Tip: You can set an alarm to remind you and watch out of your surroundings during moments like this. This is a wrap for this post and I hope you really enjoyed it. Make sure to share your funny moment in the comment section below with us. Also, if you liked this post, please subscribe to the blog through the subscription box to get new and fresh content on time. I will share more new ideas in the future and more entertaining content. Have a lovely Monday!